Newfoundland is a place which is steeped with beer culture and its brewing heritage is an important part of its story as a nation and as a province. Much of its history is only glanced at through beers which, while once brewed by small Newfoundland producers, are now brewed in the province by either Molson-Coors or AB-Inbev (as Labatt). These beers, Bennett Dominion Ale (Molson), India Beer (Molson), Blue Star (Labatt), and Jockey Club (Labatt) are brands which have been around in Newfoundland for well over half a century. 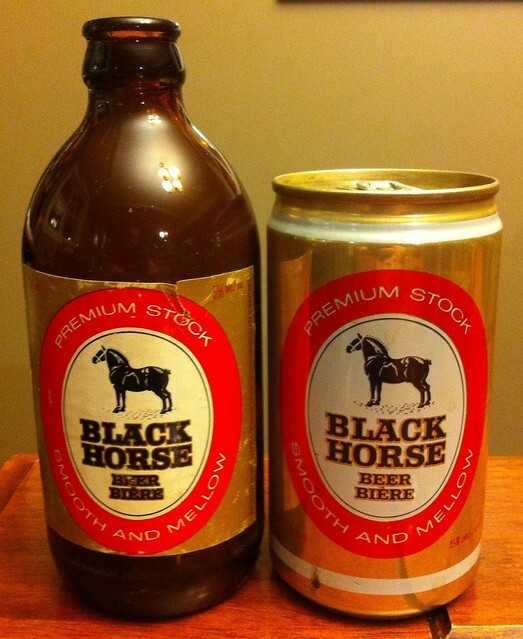 Other beers, particularly Black Horse (Molson), also have a long tradition in Newfoundland, though it was never brewed by a Newfoundland-owned brewery. Together, through these “nostalgia-macros” and the numerous other bit of material culture, advertisements, and newspapers, this site explores Newfoundland’s Brewing History. For a brief crash course in these nostalgia-macros, see this page where I provide a little context. You can also check out this article we contributed to the Newfoundland arts and culture monthly The Overcast. Know the five brands? Then let’s go. The short story of Newfoundland beer goes like this: in 1962 the three independent Newfoundland breweries – Newfoundland Brewing, Bennett Brewing, and Bavarian Brewing – were bought out by three large Canadian Breweries, Molson, Canadian Breweries Limited (O’Keefe), and Labatt. The old beer brands that Newfoundlanders loved were kept, but altered to meet the big breweries costs, images of consumer tastes, and brand portfolios. Many of the beers that we know today probably taste nothing like the 1962 versions, with some even being changed from ales to lagers to better fit the breweries new line of major breweries’ products. It’s the same general trend of consolidation that marks the history of North American beer in the 1960s and 1970s, but it’s unique because of the number of these brands that still have loyal drinkers in the province – though with many not knowing they are drinking something that is owned by a Belgian or Brazilian. While consolidation is a somewhat sad story, the happy ending is the new craft beer movement which – though Newfoundland is about 20 years behind the United States and 10 years behind the rest of Canada – is starting to take root. It’s an exciting time to drink beer and an exciting time to look to our past for ideas about where we might want to go. This site is made up of an ever expanding series of blog posts, so to allow for easier navigation I’ll give a little run down of some things which might be interesting to start with, sorted by brewery. Two general interest items which might be also of interest are my account of the “Beer Strike” of 1985 and my answer to the age-old question: why does Newfoundland have these shorter neck beer bottles? Perhaps best remembered as the brewers of Blue Star, the Bavarian Brewing Company was active from 1932 to 1962. I’ve written a fair bit about Blue Star’s graphical evolution and a little history of the brewery’s founding can be found in my post on German Brewmasters in Newfoundland, which also deals with their other popular and still existent brand Jockey Club. For more look for the keyword Bavarian Brewing on my posts or see the old overview page. They were located on Lesley Street in St. John’s, where Labatt currently has a brewery. India Beer is the only remaining beer still in production from the Newfoundland Brewery’s range of products. They used to brew an India Pale Ale as pictured to the right. There are several posts about India Beer like this one exploring old advertisements and this one which discusses one of my favorite old advertisements. For more, just check out the posts tagged Newfoundland Brewery. The brewery was located near Rennie’s River, likely near where Molson currently operates their brewery. The last of the big three, the Bennett Brewing Company, also known as the Riverhead Brewing Company, originally formed in 1827 though it is unclear to what extent they operated before the late 1800s. Their major brand, Dominion Ale which still features the Bennett name, is still brewed by Molson. They are also known for their famous Newfoundland Songbook (post forthcoming). For more information see the Bennett Brewing tag or this overview post which features some old labels, including the Rainbow Beer logo I use for this site, and some general history. Bennett was located on Water Street West, likely where DFB Group Metal Fabrication & Service Facility (22 Sudbury Street) is now. There were, along the way, other breweries in Newfoundland including The Atlantic Brewery in Stephenville and the early 20th century Lindberg Brewing Company (more on this brewery in the post on German brewmasters). For other breweries check out the other breweries tag. Photo credit, Steven Shorlin, 2013. I cannot not talk about Black Horse, the beer which is so often thought of as deeply associated with Newfoundland. It was actually a Montreal brand which became a National brand which, through happenstance, is now only brewed in Newfoundland. My best shot at a historical overview is here, though I keep up with other Black Horse history throughout Canada in many other posts which can be accessed through the Black Horse tag. A museum in Lachine, Quebec has an extensive collection of Black Horse artifacts in their “To Get a Drink You Have to Sell: Advertising and Black Horse Beer in the 20th Century” exhibition and if you’re ever in the National Gallery in Ottawa, be sure to see the painting “Black Horse Ale, Notre Dame Street, 1937” by Sam Borenstein. As this site has now transitioned to newfoundlandbeer.org, more posts are about the developing scene here. Read up on the changes from our most recent blog post for a tour across the Newfoundland Craft Breweries across the province. And follow the growing list of Craft Beer in Newfoundland to find out where the breweries are, how to find their websites and social media, and when they opened.